Presented by curatorial agency Hotel Particulier, _ HOME UNIMPROV is a new series exploring the performative home and the influence that architecture and design have on the social constructs of our society. For this presentation Hotel Particulier showed new works by John Sorensen-Jolink including Unconscious Forms, a new three-channel video installation exploring the body and its interaction with its designed environment. Also on view were a series of three exclusive 'performative' Soren chairs based on the original chair by John Sorensen-Jolink for COIL + DRIFT, with reimagined form that explores the relationship between human and object. 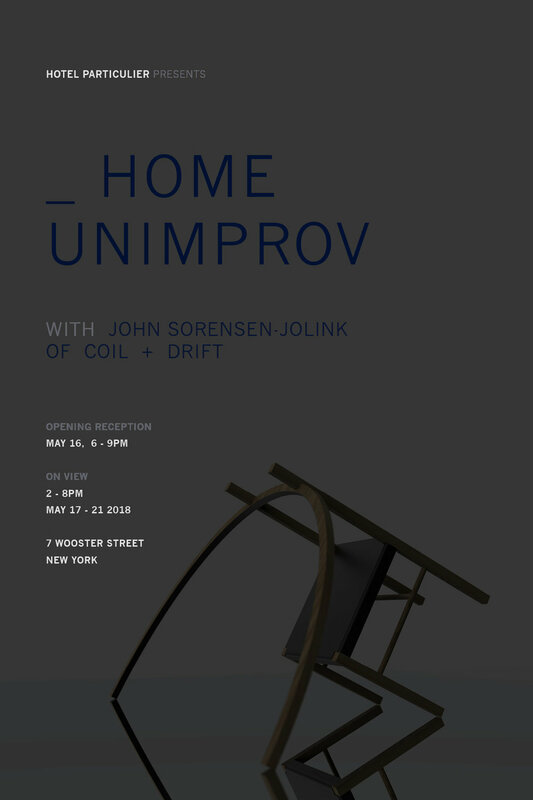 _ HOME UNIMPROV was activated by a live art performance during the opening reception on May 16.